A few weeks ago we discovered Moomah of New York, which we described as a ‘creative arts café’ but is also a ‘playscape’, a living classroom, an art oasis, a hideaway, a neighbourhood meeting spot and an exhibition space. 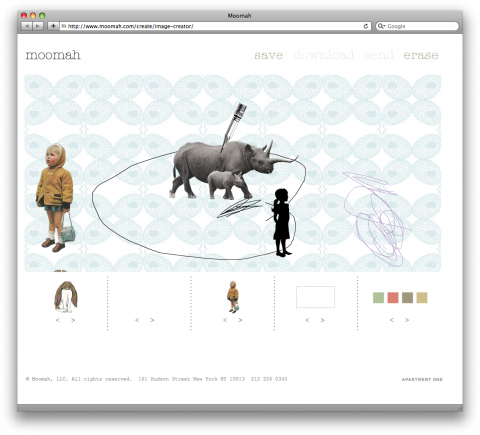 I just saw over at Swiss-Miss, the Cafe Moomah Online Collage Builder, which any child will love. The process involves a blank canvas with many elements to make your masterpeice. My three year old loved this program, it’s worth getting online and having a try with your kids. Something fun and interactive to do online.